The second of four planned racecourse cleaning surveys is set to take place on Easter Weekend at the Grand National Meeting at Fairyhouse Racecourse. The survey will be included within the racecard for patrons to complete and a VIP Hospitality Prize for two at Fairyhouse Racecourse will be on offer to one lucky participant. Pat Ryan CEO of Ryans Cleaning, committed to constant improvement and quality standards at Irish and UK Racecourses. The purpose of this short survey is to assess the quality of the cleaning service offered by Ryans Cleaning and to gain a better understanding of the attitudes and opinions of attendees in relation to event cleaning, sustainability and compliance standards. The first survey took place in Punchestown at their busy Winter Festival meeting in November and there are two more planned for later in the year. On conclusion, the final results will be published and industry standards will be benchmarked as part of the overall strategy for continued development by Ryans Cleaning. 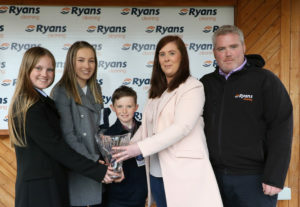 Ryans Cleaning are also proudly sponsoring the opening race of the Easter Festival at Fairyhouse Racecourse on Sunday, The Ryans Cleaning Event Specialist Maiden Hurdle which will be shown as a replay on RTÉ Racing on Sunday, April 1st. The winner of the race they sponsored at the meeting last year was the mighty Samcro for Gigginstown and Gordon Elliott who enjoyed recent success at the Cheltenham Festival so perhaps this year’s race will find Ireland’s next big hurdling superstar!